Getting there. Get to Visp in the Rhone Valley by train from Geneva or on the BLS train from Basel, Bern or Zürich, now only 2 hours from Basel through the new Lötschberg Basis Tunnel. There are really four ways to get to Zermatt from Visp. 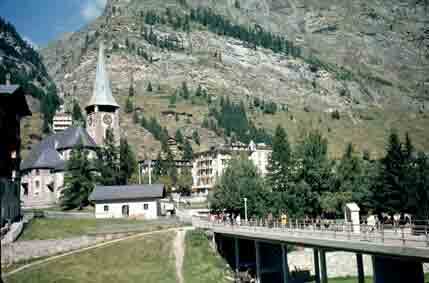 or thumb a lift to Täsch & ride or walk (1 1/4 hours) to Zermatt. b) Walking up the valley, about 10 hours or break it at one of the villages. c) The high level footpath called the Europaweg on this link. have to get the train, which was Sfr 7.60 in 2008 but will doubtless be more today. ...you need somewhere to stay. I usually stay in the Hotel Couronne these days, which is conveniently by the bridge & middle priced. Failing that, there is the Hotel Bristol opposite. I used to stay in the exceptionally atmospheric Hotel Mischabel, which has sadly been replaced (2007) by a block of flats! The cheapest hotel is the Gabelhorn (no dinner) & there is a camp site near the railway station. If you are seriously rich, try the Zermatterhof. There is a wide choice in between. The town has a web site of its own. It has changed a bit but not a lot since this 1970 photo. I have done all these walks myself. 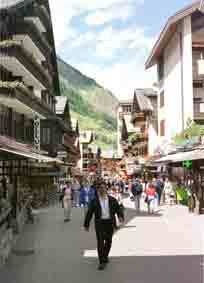 You need the Swiss Landeskarte 1:50,000, sheet number LK5006, "Zermatt und Umgebung", Umgebung means surroundings. If you are a climber, these pages are not for you. Try the West Col guide for the Pennine Alps. For wintry types, the skiing is fantastic but there is always plenty of ski advice, so I don't add much to it. This is if you get to Zermatt at lunchtime. Cross the bridge by the church & turn right up to Winkelmatten. Stop at the café with the crystals on sale for lunch, perhaps. Turn left up the path marked to Findeln. This does a few zig-zags, then along the side of the Findeln Valley to the village. Two good cafés that do home-made cakes will provide your tea. 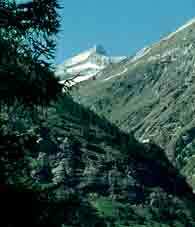 Admire the view of the Matterhorn but look along the valley to the Unterrothorn, as it is good for another walk later. On your way back to Zermatt, take a path to the right about 0.5km from Findeln & go through the woods, full of flowers in Spring & after about 1.5km, take a decent looking path to the left which brings you back to Zermatt. Alternatively, carry on up past Findeln to the path marked to Sunnegga & then, on to Tuftern. There is a marked path back from Tuftern via Patrularve (ski lift point) to Zermatt. You should now be hooked! The rest of the walks are all day ones. 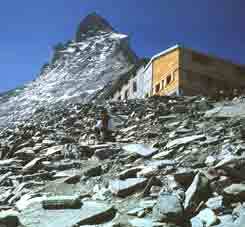 This is the hut adepts use to climb the Matterhorn from this side. You can either walk up to the Schwarzsee or take the gondola to Furi & then, a cable car. To walk, there are two good starts. Either take the path to the right of the stream signed to Zmutt but turn left when you come to a sign for 'Zum See' to Zum See village. Or, go to Winkelmatten again but go straight ahead on the path marked to Blatten. village. There, turn right for Zum See village. From there, the path goes up to the left into woods to Hermettji (café), then steep zig-zags at first & a walk up to Schwarzsee. 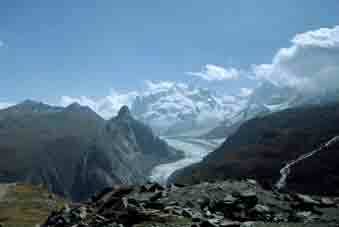 Terrific views of Monte Rosa, the Dente Blanche & Gabelhorner. Follow the marked path to the hut, which goes along a ridge before zig-zagging up shaly stuff. 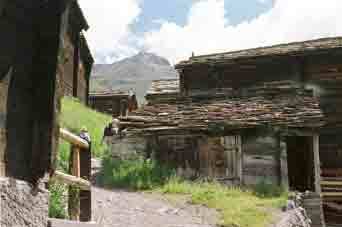 There is a hotel, the Belvedere next to the hut. Both serve food. 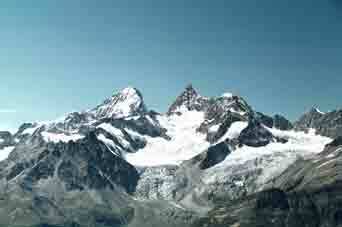 You will be able to see that the difficulties on the Matterhorn climb start immediately! Going down, either go back to Schwarzsee or break left after the zig-zags & before the ridge to the North, which eventually brings you out to Zmutt Village & thence back to Zermatt. No, I haven't climbed the Matterhorn. If you want to & are not an experienced climber, hire a guide. It can get rather crowded &, as it is easy-but-dangerous because of loose & falling rock, I prefer to give it a miss. Last revised 16/7/2015 © 1998-20152 Ken Baldry. All rights reserved.